New habits of self-care and wellness seem to have become increasingly more common in the last couple of years as we all try to live our best life. Personally, I am 100 percent here for it as I patiently wait for my Cardi year, OKKURRT! Yoga has been a part of my life for over two years, but more consistently for about a year now. For the most part, it has been an at-home practice, using the YogaWithAdriene Youtube channel as my primary source with the occasional class here and there. I felt the most comfortable at home, but I also didn't find my crowd yet. Yoga classes can become quite a large expense over time, so I really wanted to love where I practiced. So since moving back to the Fort Lauderdale area, I've been in search of my yogi home! I went to two classes, both hosted by black women—AND I WAS IN LOVE! Communities of color are often excluded in the wellness space, so coming across these instructors were a breath of fresh air, LITERALLY! The classes were filled with beautiful people of color, mostly women, I couldn’t help but think this may be the crowd I was looking for. While I continue sharing my experiences with these two women, I will share an additional yogi to look out for as well. Check out her Instagram to find more information about her two weekly classes and upcoming project Yoga OM Brunch, a quarterly brunch by the beach that includes morning yoga, healthy foods, discussion and ending with fun in the sun! Brea has been a dedicated yogi for over a year but has been a Hatha yoga teacher for about six months. She is also versed in Vinyasa flows and Kundalini techniques that she incorporates in her independent practice. I attended Brea’s Flow & Grow Sunday’s class, a FREE yoga (yes free! ), and wellness-centered event on the first Sunday of every month in Lauderhill. It was a whole wellness experience, there was infused water, calming park yoga, healthy after-yoga breakfast, and group discussion with supportive people of color. There was talk about dreams, entrepreneurship, mental health and more. Brea treats yoga as an individual practice to help focus on self-growth, but also bring people together without competition. 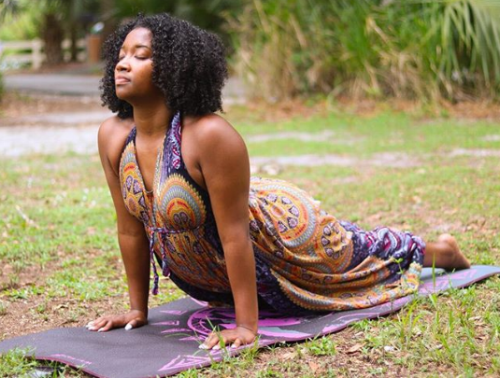 She believes that holistic practices like yoga are often “far removed” from communities of color despite its endless benefits and effects on life. Her classes and FREE Flow & Grow Sunday’s project are ways that she gives back to the community she grew up in as well as connect to herself and practice. Follow her on Instagram to know when and where she will be teaching a class near you. Hope to see you at the next Flow & Grow Sundays. Natasha has been practicing yoga for three years and has been teaching Ashtanga yoga consistently for one year. She also combines free spirit yoga movement focusing on whatever feels good to the body. Her practice aims to help people “learn how to master their own energy” through yoga and brings them out of their comfort zone to show what they’re capable of doing. An advocate for yoga, meditation, and art as a tool to release stress, anxiety, depression and self-esteem issues, Natasha is out here trying to help her students reach their true potential on or off the mat! For now, she teaches bi-weekly Sunday classes but is also working on an amazing online class for people to practice from anywhere in the comfort of their homes. And like I said before, I love a good home practice, so I approve! I have yet to attend one of Natasha’s classes, but from what I hear I will be front and center at her next one! Visit her Instagram to see when her next class will be and check out some of her artwork while you’re there! Let me know if you get a chance to practice with any of the incredible women above. Comment below to share any other yogis of color in the South Florida area!